Known as the second most popular sport in the world, cricket is regarded as region in those parts of the world where it has existence. Well, for those people who take this sport as religion, there is only one God – Sachin Tendulkar. Sachin Tendulkar holds many records (if not all of them). When it comes to most centuries and international runs, he is sitting pretty at the top (both in ODIs and Test matches). I am here talking about the purest form of cricket – Test cricket. The Master Blaster has scored 15,921 runs 200 test matches with the staggering average 53.78. There was a time when he hung his boots; we all thought that this record is going to stay forever. But, hang on! England captain Alastair Cook is all set to surpass Sachin’s record. The southpaw from England has scored 11,629 runs in 147 Test matches. Among the active players, he is the closest to Tendulkar’s record as he is only 4292 runs behind the master. I am not saying he will definitely break the record, but you can’t ignore the fact that he has all the credentials. 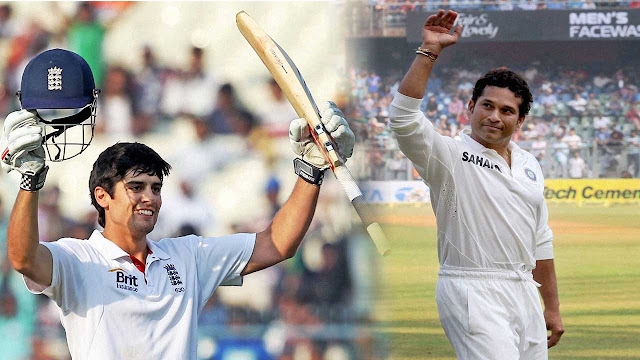 Why Alastair Cook is a threat to Tendulkar’s record? Time on His Side: Cook is 32, which gives him at least 4-5 years of cricket. England play a lot of cricket. So he is likely to play around 50 test matches, which is enough time for a player of his caliber to achieve the unachievable. Only Plays One Format: He doesn’t play limited-over cricket. It will help him to stay fit and in good rhythm for test cricket. Opens the Innings: Being an opener, he always gets a lot of overs to play and score big. This it one advantage as he has more chances to play the second innings as well.